Fires, pepper spray, smashed windows, punches, assaults, riots, domestic terrorism — all are results of recent protests across the nation in which freedom of expression has escalated to violence. 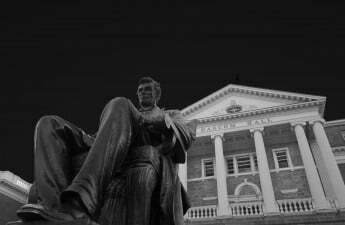 In the aftermath of violent protests on college campuses from University of California-Berkeley to Middlebury, and the deadly events of Charlottesville, some think it’s possible the University of Wisconsin could also reach a tipping point. Shapiro penned “morons” on the whiteboard, before calling protesters babies and flipping them off. But he also asked them to have a conversation. Some of the protesters refused, while others expressed their opinions, garnering laughter and boos from the audience. “You guys are here, shouting down people who are speaking,” Shapiro told the protesters. “Because this is my campus. This is how it starts,” one protester responded. 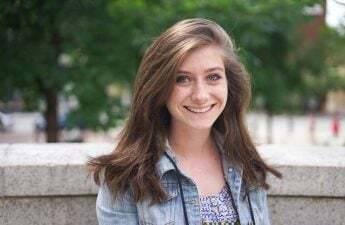 Though the protests at the Ben Shapiro event did not spark physical violence, UW senior Grace Voegeli, who attended the event, was fearful it could have. Frustrated with the “anger and immaturity on both sides,” Voegeli noted the failure for there to be an open dialogue. But UW junior Eneale Pickett, one of the protesters at the Shapiro event, said Shapiro’s speech was dangerous because Shapiro was targeting underrepresented students and spreading hate. Pickett said Shapiro shouldn’t have been allowed to speak at all. Across the nation, many violent protests on college campuses have started with controversial speakers like Shapiro. These recent incidents have sparked debate about when — if ever — it is appropriate for states or universities to limit speech. Some left-wing advocates hope to silence the voices of controversial speakers they perceive to be hateful or threatening. 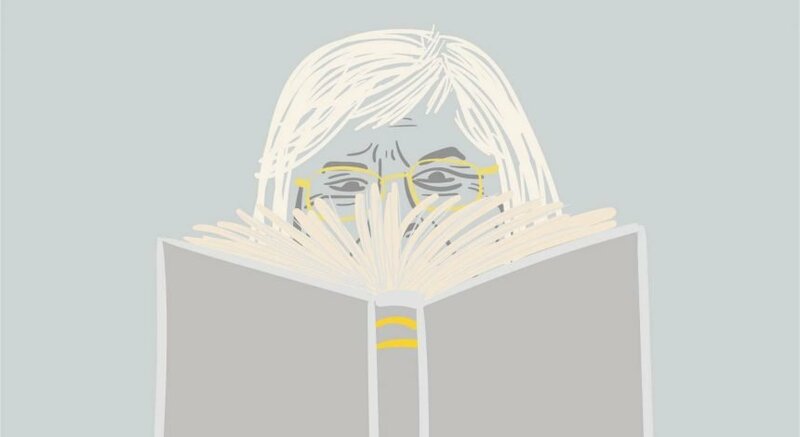 On the other side of the aisle, many conservatives believe in the university’s right to disallow speech which overpowers or disrupts speakers, however controversial they may be. Whether protests and speakers are liberal or conservative, peaceful or disruptive, UW sophomore Charlie Mueth said there is typically one common thread: A failure on both sides to listen. 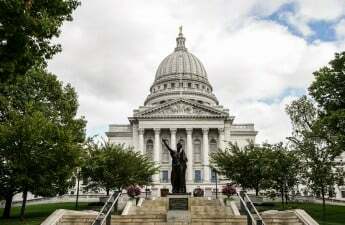 To prevent divisive events like Shapiro’s lecture from escalating to violence and to protect speakers’ free speech in Wisconsin, Rep. Jesse Kremer, R-Kewaskum, drafted a bill. This past June, the bill passed through the Assembly 61-36, with all Democrats opposing. 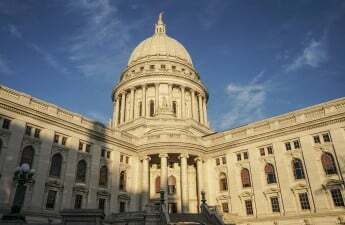 If passed through the Senate, it will be sent to Governor Scott Walker’s desk to be signed into law. The bill requires the Board of Regents to adopt policies that punish students who interfere with the expressive rights of others. Under the bill, the second time a student interferes with the speech of another they could be suspended; the third, expelled. The bill also includes due process protections so students are not unjustly disciplined. In December 2015 and again this past July, the Board of Regents passed resolutions reaffirming their commitment to free speech. 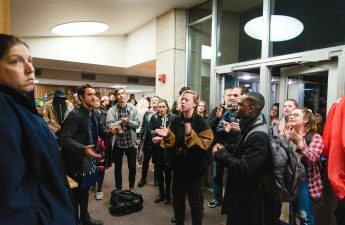 The July 2017 resolution was not punitive in scope, but the regents promised to review existing policies to ensure civil discourse is achieved on UW campuses. The UW System did not comment on whether they support the Campus Free Speech Act. Democrats have criticized Kremer’s bill for being too broad and too harsh. Rep. Chris Taylor, D-Madison, said the bill never defines “interfere with,” making it unclear what actions could be grounds for expulsion. As the bill is written, Taylor said shouting out “no” or “boo” during a speaker’s event could count as interference. “If you are at risk of being expelled, are you going to speak out?” Taylor said. This would be a chilling effect, the grounds on which Howard Schweber, a UW professor and expert on free speech, thinks the bill is unconstitutional. A chilling effect ensues when one is “reasonably afraid” of the possibility of punishment, so they engage in self-censorship, Schweber said. Though he doesn’t think it was the Republicans intent, Schweber said the “sloppiness” of the bill makes it unclear what kind of speech protesters can engage in without punishment. “The whole thing is written in a way that just begs to be used as a weapon to silence voices that someone doesn’t approve of,” Schweber said. College Democrats press secretary Claudia Koechell also found the legislation “intimidating.” Koechell said it could stop students from engaging in lawful protest. 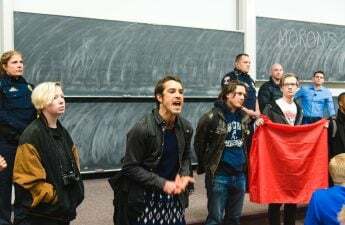 But College Republicans spokesperson Emelia Rohl said in a statement that the bill respects students’ right to protest while ensuring controversial speakers are not disrupted. To prevent a chilling effect, Kremer said the bill requires a freshmen orientation that would explain free speech rights and acceptable protest. UW political science professor Donald Downs, an expert on constitutional law and free speech, said no one has a right to prevent others from exercising their First Amendment rights, including students. He believes in the need for a penalty against students who attempt to shut down the speech of others, and a three-strike expulsion rule is a punishment that fits the crime. Still, Downs ultimately does not support the bill because he believes the state Legislature is overstepping its bounds. He said universities should be given a chance to solve these problems on their own and find a policy that will work best for students. “It’s the first time in the history of the state that the state Legislature is dictating how we punish students,” Downs said. Kremer, however, said this bill is needed to push the Board of Regents into action. While College Democrats and Republicans disagree on the bill, students from all areas of the political spectrum agree that diversity of opinion is crucial on a college campus. Vitolo-Haddad is liberal. La Sage is conservative. Where, then, is the disagreement? While almost all Americans agree on the importance of freedom of speech, when it comes to the free speech debate, Schweber said people end up talking past each other because of gray areas and confusions about the First Amendment. This is exemplified in the debate over the campus free speech bill. Democrats and Republicans agree freedom of speech gives us the right to peacefully protest. But what about disruptive protest that overpowers the speech of someone else? Vitolo-Haddad, whose preferred pronouns are gender-neutral, is a member of the group Student Coalition for Progress. 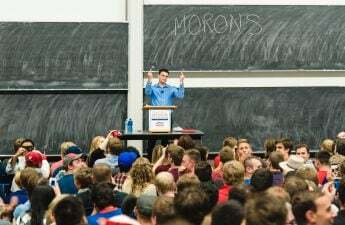 Though the student group was not fully formed at the time, current members of SCP helped organize the protest against Ben Shapiro. While Vitolo-Haddad was not at the event, they said in a public setting like a university, students have the right to express themselves with their voices — even if that has the effect of stopping someone else from speaking. But Downs said according to Supreme Court cases, that is not a student’s right. Students have a right to protest and engage in counter-speech as long as it doesn’t disrupt the speaker, Downs said. They can silently protest inside, loudly protest outside, argue against the speaker in Q&As or organize their own events. 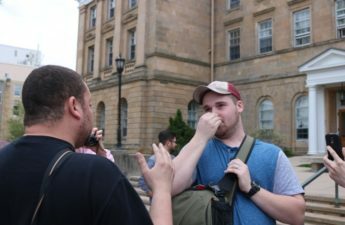 “They don’t have a right to disrupt because then that means basically any student group, any small number of students, can dictate to the rest of the university community what they’re entitled to hear,” Downs said. In the case of students who shout over speakers, Downs said that would be considered a substantial disruption that interferes with the free speech rights of the speaker. When this happens on public or university property, the government — which includes the university as it is a state agency — has the right to step in. “Materially and substantially disrupt” is language that is used in Kremer’s campus free speech bill. Though this part of the bill is founded on a Supreme Court decision, Koechell said College Democrats think “substantially disrupt” is unclear. The 1969 court case does not explicitly define the term. Another point of contention arises with the commonly used phrase “hate speech.” Downs said hate speech is an “incredibly vague” term that muddies the water when talking about the scope of free speech. Hate speech is defined as speech meant to insult, offend or intimidate someone because of a part of their identity. At left-wing protests, students often hold signs that read “hate speech is not free speech.” Since Shapiro was “spreading hate speech,” Pickett said he should not be given a platform. While Schweber thinks we should condemn the deplorable language and ideas that are often labeled as hate speech, he said the speech doesn’t become unprotected simply because it is offensive. If the Supreme Court were to ban hate speech, it would be impossible to draw the line of what kinds of speech are acceptable, Downs said. 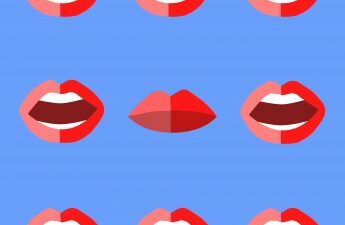 “Being overly sensitive about the impact of speech can lead to all sorts of calls for suppressing speech that should be protected,” Downs said. Sometimes hate speech ends up getting banned, but this is usually because of the conduct in which the speech is delivered, not the content of the message, Schweber said. In the same vein, UW spokesperson Meredith McGlone said points of view may be “offensive or inflammatory,” but that doesn’t mean they violate the law or university policies. McGlone said the bias response policy was created to ensure campus is free from harassment and intimidation, even when hurtful speech does not violate a specific policy. In June, the Supreme Court ruled in agreement with these points, making it clear that the first amendment has no hate speech exception. While students who are liberal think this opens the door for bigotry and hate, La Sage, a conservative student, said she can support free speech while condemning offensive rhetoric. She said it’s important these opinions are expressed so they can be denounced rather than boiling under the surface. 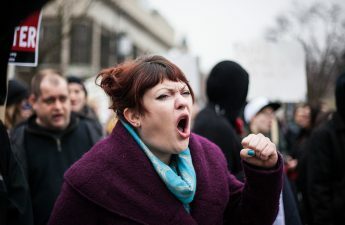 These semantic disagreements sharply divide the left and right, sometimes to the point of turning discussions into hostile yelling matches. Other times, people resort to harassing and intimidating those with dissenting views, leaving those targeted hesitant to express their free speech in the future. There have been 78 hate and bias incidents reported to the Dean of Students office so far in 2017. Of those, 18 percent of victims were targeted because of their political affiliation. When Steve Forbes came to campus, Vitolo-Haddad was protesting capitalism at the top of Bascom Hill. In the midst of a conversation with pro-capitalism students, someone videotaped Vitolo-Haddad and posted it to YouTube without permission. Despite being an opinionated activist who teaches others the importance of debate, receiving death threats gives even Vitolo-Haddad pause about expressing their speech. “It’s definitely something that makes you hesitate,” Vitolo-Haddad said. In Gordon’s dining hall, La Sage was also harassed for her activism. While sitting at a College Republicans tabling event, multiple strangers approached with the sole purpose of calling her names, without attempting to engage La Sage on her views. La Sage did not want to repeat any of the names she was called, for fear others would make assumptions about her too. La Sage has also been in classes where professors make jokes about conservative students or have singled her out for her conservative laptop stickers. While some instances of hate and bias are forms of speech which people are allowed to express, Downs said when students are targeted for their opinions, it suppresses open discourse. Downs said it would be productive to have an orientation or training for freshmen on civil discourse and first amendment rights, something that would be implemented if Kremer’s free speech bill is passed. La Sage suggested having more debates, similar to debates held between College Republicans and Democrats. For controversial speakers, Voegeli said it would be helpful if there was always a Q&A session or panel afterward so opponents would have a platform to pose counter-arguments. 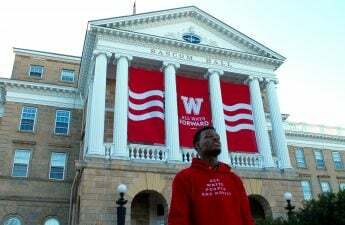 Vitolo-Haddad said it’s important for students to continue expressing their voices and engaging in peaceful protest — something Madison has done for decades. Vitolo-Haddad pointed to the protest held against the Steve Forbes event as a good example of productive debate. Even though the YouTube commenters were hateful, Vitolo-Haddad had an open dialogue with supporters of capitalism. In terms of preventing future harassment, McGlone said education is key, and encouraged students to report incidents of targeting based on political affiliation to UW’s bias reporting system. That way, the university can have an educational conversation with involved parties to eliminate ignorance on campus. While Vitolo-Haddad said it’s impossible for students to always engage in constructive debate, the campus can still make changes for the better.